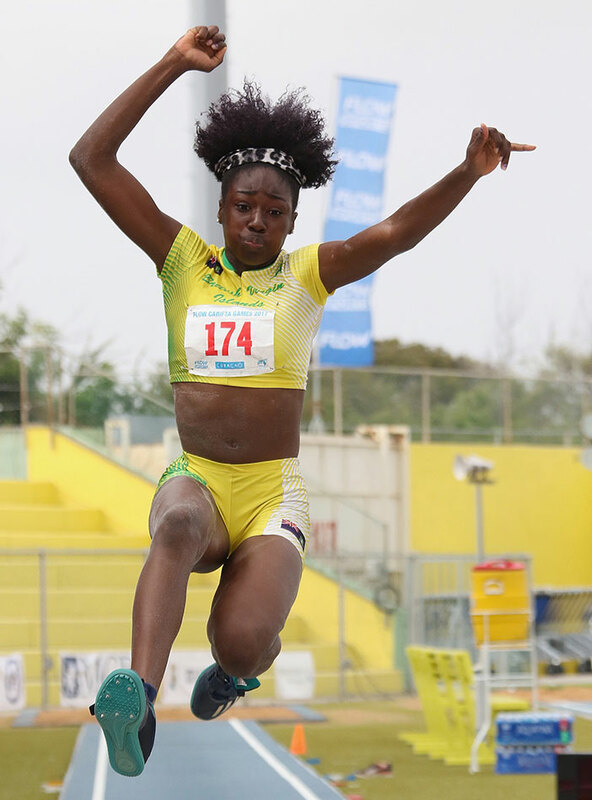 Kala Penn, a sophomore at ASA College-Miami, made history by becoming the territory’s first female athlete to earn double All American honors outdoors, after overcoming injuries, then grabbed second place finishes in both the long and triple jump events at the National Jr. Colleges Athletics Association Championships, that ended in Butler, Kansas, on Saturday. She joins shot putter and discus thrower Eldred Henry, who complete the feat in 2015, winning both events. During last year’s indoor championships, Nelda Huggins won the 60m dash and was second in the 200m. In the process, Penn became the territory’s seventh athlete to have won Jr. College All American honors during in, or outdoor competition since 2014 and they have combined to win 13 overall in that period. In all, 12 athletes have earned the honor since long jumper Ralston Varlack, in 1996. Between both jumps, she competed in the 100-meters prelims and was fourth in her heat with a non-advancing time of 12.35 seconds. She also ran second leg on her team’s 4×100-meters relay that was sixth in 45.68 seconds. Since injuries slowed her early season progress, Penn said it meant a lot to be able to compete at nationals. Penn, who worked with late coach Dag Samuels, dedicated her performances to his memory and said it was hard losing someone who was a major part of her development. Three other BVI athletes also saw action in the JUCO Championships. Barton County College freshman Adriano Gumbs, helped his team to a fifth place finish in the 3200-meters relay final, finishing in 7 minutes, 44.22 seconds. He had a one minute 57.36 seconds third leg carry. Central Arizona College sophomore Tarique Moses—in the same race—helped his team to a 10th place finish in 7:51.64. He ran third leg and had a 1 minute 58.34 seconds split. Gumbs then had a non-advancing time of 49.05 seconds in the open 400-meters, that immediately followed the 3200 relay. In another heat, ASA College (Miami) Ronique Todman, finished in 50.70 seconds in his heat, well off his 48.37 seasons best. He ran 21.85 seconds for third in his 200-meters heat, but did not advance. Gumbs busy championships saw him leading off his team’s 1600-meters relay, that finished second in 3 minutes, 10.42 seconds and advanced to the final, where he had a 45.90 seconds anchor leg split, helping his team to a fifth place finish in 3:08.75. Moses anchored his team to a ninth place finish with a 48.05 carry, but they missed the final with 3:14.12. Elsewhere, in Arizona, strongman Eldred Henry won the Tucson Elite Classic shot put on Saturday, after placing second on Thursday, with his best results since 2015. Henry improved on Thursday’s second place effort of 19.53m (64’1”) on his fourth attempt of the competition, with a season’s best 19.56m (64’2’). On Thursday, he followed up his 19.53m throw (64’1”) with a 19.24m (63’ 1½”) effort and on Saturday, had a 19.05 (62’6”), marking his best series after becoming the first OECS 20m (65’7½”) thrower in 2015. Meanwhile, during the busy weekend, three athletes competed in the Whitsuntide Games in St. Georges, Grenada. Trevia Gumbs used a personal best and meet record of 48.50m (159’1½”) to win the discus throw. Twin sister Tynelle was third with 46.07m (151’1¾”). Trevia also won the shot put an outdoor best heave of 15.38m (50’5½”), with Tynelle finishing second with 14.54m (47’8½”). Akira Phillip used a mark of 37.26m (122’3”) to place third in the javelin throw. In high school action at the Flo Golden South Classic competition in Clermont, Florida, 14 Sprint Tech Track Club athletes saw action in the Prep Division on Saturday, while Sunday’s Classic Division was cancelled due to inclement weather. Jaleel Croal ran 11.50 seconds to win his his 100m heat and was seventh overall. Josh Lynch’s 11.80 time, placed him fifth in his heat and 21st among the rankings. Nickelia Drummond won her 100-meters heat in 13.18 seconds and was 22nd overall. She ran 27.24 seconds for fifth in her 200m heat and was 38th overall. Lynch, J’Mari Duhaney and Wayne Bell, each finished second in their respective 200m heats. Lynch had a time of 23.72 seconds, 21st overall, Duhaney 24.01, 27th and Bell, 25.56, 51st. Khoy Vanterpool was fourth behind Duhaney in 25.18, for 48th overall. In the 400m, Ariyah Smith and Kenyatta Grate, were second in their respective sections. Smith was timed in one minute, 01.86 seconds and Smith was timed in 1:04.96. Alisha Hayde finished third behind Smith with a time of 1:03.34. Smith was 12th overall, Hayde 15th and Grate, 23rd. Among boys in the 400m, all three placed third in their respective heats. Malik John had the best time of 52.48 seconds to place 15th overall. Duhaney was 28th in the rankings after turning in a time of 53.71, while Gevon Smith’s 55.19, was 36th overall. Jonathan Hing made his hurdles debut in the 300m, finishing fourth in his heat in 44.44 seconds, the 11th best mark of the competition. Samuel Romney used a personal best of 2 minutes, 05.92 seconds to win his segment of the 800m and placed 13th overall. Alliana Davis’ throw of 6.59m (21’7½”) was good for third place in the shot put.